one and the same person." and flexible in your expectations. Learn how to achieve the ideal life of a trader, which is to live anywhere you want (as long as it has a good internet connection) and be financially independent. This is not an unrealistic dream but the higher the income you require then the harder it gets and the longer it will take to get there. This is part 2 of our three part trilogy on trading. In the first part "How to trade" we gave an overview of what things you can trade, how trading is generally accomplished, and (in many cases) what you should expect from returns once you have gotten pretty good at it. In this part we will look at being a trader and what that requires. I know a guy in Seattle who just wants to make two points a day on two e-mini futures contracts (ES). He is a single guy living in a modest but nice apartment in a pleasant part of the city that is within walking distance of almost everything he loves to do. 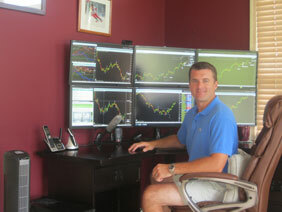 He has a small trading account and is usually done trading in the first hour or two of the day. This type of trader lifestyle is achievable with much less difficulty than those with higher financial goals. I know another guy who lives on a huge plantation in Hawaii and supports himself trading. He does this successfully but he has been a trader for many years, is well funded, and is fearless in trading large amounts of money (including large losses on losing trades). Most people could not tolerate the size of his trades. His trades could be up $25,000 or down $25,000 at any one time. If you are not limited by how much money you can trade, you will be limited by how much tolerance you have for the drawdowns that are part of trading. Drawdowns represent losing streaks, which will happen but can be managed. Airplane pilots can make poor decisions about their flying if they rely on their natural sense of up and down. Vertigo is when your sense of motion and up/down relationships are wrong. When you are flying in an airplane and you can't see the ground (clouds or darkness), you may experience vertigo and crash. Traders also suffer from inaccurate natural instincts when they trade, and like the pilot, they need to use their instruments, training, and rules to take the correct action -not the instinctive action, or they will crash. For this reason you can't be a successful trader if you plan on jumping into trading and using your natural senses and feelings to make trading decisions. One common disaster that new traders fall into is poor risk management. It's like they're playing poker and they push all their chips in on a big hand. In trading we use a baseball analogy and call it "swinging for the fences" (trying for a home run). Swinging for home runs tends to lower your batting average. In trading swinging for the fences tends to get you thrown out of the game, permanently. I own a business that sells computers to traders and more than once a novice trader was completely broke by the time the new computer arrived. They were taking on way too much risk when they traded. In trading you avoid big risks and make your money one trade at a time, trade after trade. You need to be able to sustain several losers in a row and still be able to trade effectively. The key to profitability is the combination of your winning percentage and the relative size of your winners compared to the size of your losers. If you make $300 on your average winner and you lose $120 on your average loser then you can be very profitable with just 45% winners: $300 x .45 - $120 x .55 = $69 average profit per trade. This is the secret to making money at trading: not high percent winners but bigger profits on your winners and limiting losses on your losers. In trading we say "let your winners run and cut your losers short". However, you need give your trade reasonable room to run against you or your winning percentage will be very low. Generally you should try for your winners to be 1.5 times the size of your losers in average markets and two times your losers in good trading markets (strong directional movement with bigger daily moves). You start by looking at the price action and deciding on a reasonable exit, then multiply that by 1.5 for your minimum profit target and decide if you think it can make it there based on the current market conditions and the nearest resistance levels. When you reach your target you may want to take half off and let the rest run, or just let the rest run. You don't usually stop a winner just because it hit the magic number but you want to see if it will go further. You will be using experience and technical analysis to analyze the potential to hit your target (more on that later). Traders should be able and willing to go short if they plan on trading for a living. Shorting is how you make money when a security (stock, bond, option, futures contract) drops in value. It is not an intuitive thing to understand as there are no real examples in your daily life. But let's try out an example: Imagine that a bunch of hunters are in your little mountain village and the car carrying some of their stuff got lost, so you borrow your friend's shotgun and sell it to one of them for $1,000 because that is now the going rate in your village due to the shotgun shortage. Later on the hunting is over (and the shotgun shortage is over) so you are able to buy it back for $500. You then return the shotgun to your friend and pocket the $500 left from the original $1,000 sale. Shorting stocks is when you borrow the stock from your broker and sell it. Later you will buy it back and return it to your broker. In futures trading you simply sell the contract, no borrowing is needed. This is because in stocks the number of shares in circulation is limited but with futures contracts there is no limit on how many/few contracts may exist.